This beautiful 10" china round message plate can be personalised with a name, date and occasion so is perfect for a Christening celebration (25 Characters per line). 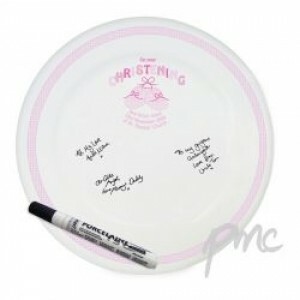 Supplied with ceramic pen for guests to sign. Once writing is dry you can bake the plate in your own oven for 30 minutes and the messages become 100% permanent.